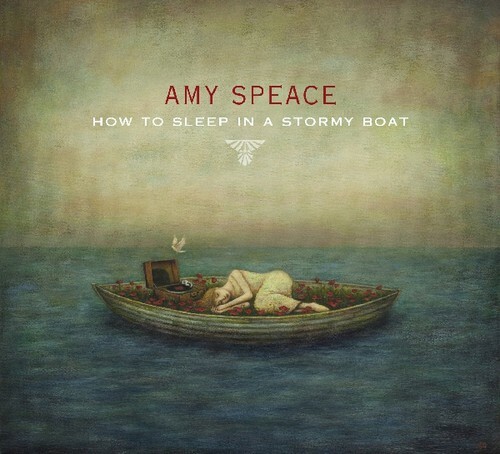 Discussions Magazine Music Blog: AMY SPEACE/How To Sleep In A Stormy Boat: Available April 16th, 2013! AMY SPEACE/How To Sleep In A Stormy Boat: Available April 16th, 2013! More than anything, this is album of grief over lost love. “When people go through things that are beyond comprehension, a trauma or loss, we turn to music or we turn to poetry to make sense of our deep pain. We grieve alone. We used to grieve in community. We used to turn to theater,” Speace says. She came to songwriting a little later than most in her craft. She started out in her artistic career as a stage actress and director, working mostly in Shakespearean repertory companies, and so deeply is she immersed in the work of Shakespeare, that it was natural for her to think about her pain through the framework of the Bard’s words. "I actually thought about putting some of his words to music to express what I was going through, but these other songs kept coming, and I gave way to my own words,” she says. “I went back to read the plays and found this very modern lamenting of love, lust, longing, denial, betrayal, rage, sorrow--everything I was wrestling with myself, feeling isolated and lost: the madness of the dream. And for the first time these plays weren’t just these ancient texts to study at arm’s length but seemed like necessary balm. Like a conversation between worlds and even between different parts of myself." The title track was chosen as the title of the album with purpose. “It’s the vessel that is stormy here, not the sky, not the storm, not the water” says Speace. It’s a prayer for peace during emotional tumult (“Show me how to fly in a starless sky/Help me to hold on when there’s no guiding light/Teach me how to sleep in a stormy boat”). “I was thinking about King Lear a lot while writing this song,” says Speace. “His storms were internal – his most beloved (his daughters) were turning against him, and he was going mad, and he ends up desperately raging against a literal storm. There were times in the past year I could totally relate. Something drives you to your knees, and no amount of bartering with the gods is going to get you through until you surrender to powerlessness." Another standout track on the album is “The Sea & The Shore,” her duet with Grammy-nominated fellow singer-songwriter John Fullbright. She had known Fullbright for a few years as fellow travelers on the singer-songwriter circuit. “For a younger artist, he is wise beyond his years, and has this world weary quality that I thought would fit the song perfectly. I was elated when he agreed to do it,” she says. The song chronicles a relationship between the shore, always solid, always there, growing weary of the sea’s mercurial nature – the sea full of professions of love and adventure, but ultimately always retreating. Finally the shore loses faith, and the sea retreats one last time. The shore stays, stronger and wiser. Speace was in a restaurant with a friend in 2011 when she started to lose her voice. Thinking it was allergies, she went home put herself to bed, and when she awoke, her voice was gone. After several days, it had not come back. Panic set in, and she gave into tears, “which is the last thing you want to do when you have acute laryngitis, which is what it turned out to be,” she says. Without her voice and in need of something drastic, she enrolled in a Vipassana meditation course, which required ten days of commitment to Noble Silence, which involves not only abstaining from verbal communication, but non-verbal communication as well. The depth of the silence was overwhelming and terrifying but in the end life changing and healing. The discipline’s focus on impermanence and equanimity were essential in helping her frame her grief and gain understanding of her own struggles. By the end of the experience, her voice, both literal and artistic, had returned. Speace recorded this album in Nashville with her friend and producer Neilson Hubbard. “I’m always open to new ideas about potential collaborators, but when I heard these songs in my head, it was his textural sensibilities that I was hearing.” In addition to Fullbright, Mary Gauthier guests, both on background vocals and as the co-writer of the song “Left Me Hanging.” Ben Sollee also added cello to a couple of tracks. There are many other standout tracks on “How To Sleep In A Stormy Boat,” making it the album that Speace feels is the best of her career. “This is more than a simple breakup album. This was deeper for me. It's like a breakup with the spin cycle, the lover, the dream, the part of myself who would not have been able to look at my part in it all. It’s a sobering process, excavation. I've never put so much of myself into an album before, and never been as happy and proud of the results.” With her deeply honest look at herself and her journey through grief, Amy Speace has created a timeless album that will sit gently beside those on the same path she was, whispering in their ear a message of love and understanding. "There are voices that serve as a bridge from the past to the future and act as soul connectors, and as a people we need them to keep singing. They tell us who we are, somehow. History resonates in them, and yet their sound is contemporary. These voices open hearts with this rare, one in a million quality. Amy Speace has such a voice, and I am not the only one who hears it. Just ask the legendarily discerning Judy Collins; she'll tell you. Amy's got it, and then some. She is a timeless artist, a time traveler. Part past, part future. And that’s a good thing, a really good thing." "Amy Speace is a rising star." Speace exudes the vulnerability of someone who's loved and lost." with universal experience, Speace is just what you need to hear." full of genuine emotions...the record soars with salient vocals and poetic lyrics." 04/12 Saratoga Springs, NY @ Caffe Lena w/special guest Davey O.